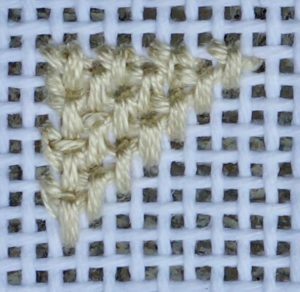 The Tent Stitch, is the basic diagonal stitch which is the most recognized of needlepoint stitches, and can be stitched in three variations: The Basketweave, the Continental and the Half-Cross. There are pros and cons and a time and place for each of these stitches. 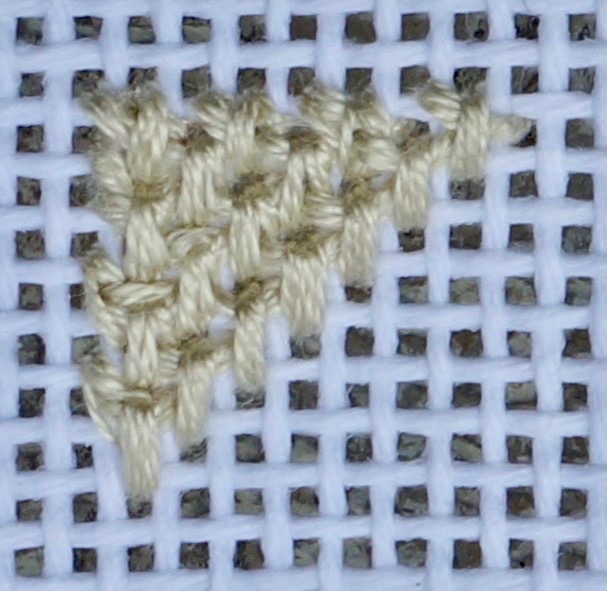 The Basketweave Stitch is stitched on the diagonal as diagramed (see Figure 2) and creates a solid pattern on the back of the canvas (see Figure 1). 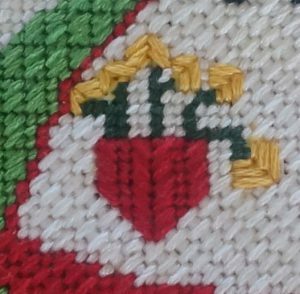 This is the stitch of choice for chair seats, upholstery items or any piece that will receive wear and tear. 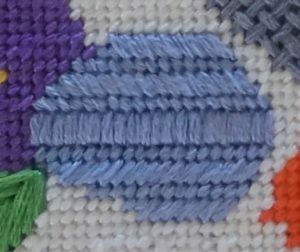 It is durable and flexible and the finished piece does not warp as much as those done in the Half-Cross or Continental Stitches. It is truly a background stitch to be done around designs. 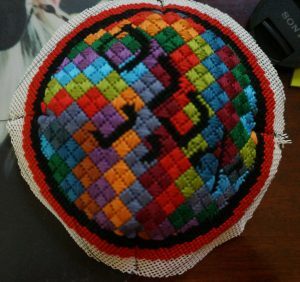 I didn’t use it anywhere on the yarmulkes I made, but I did use it for the purple border of my Pansy Quilt Rug. The Continental Stitch is also a good backing stitch. 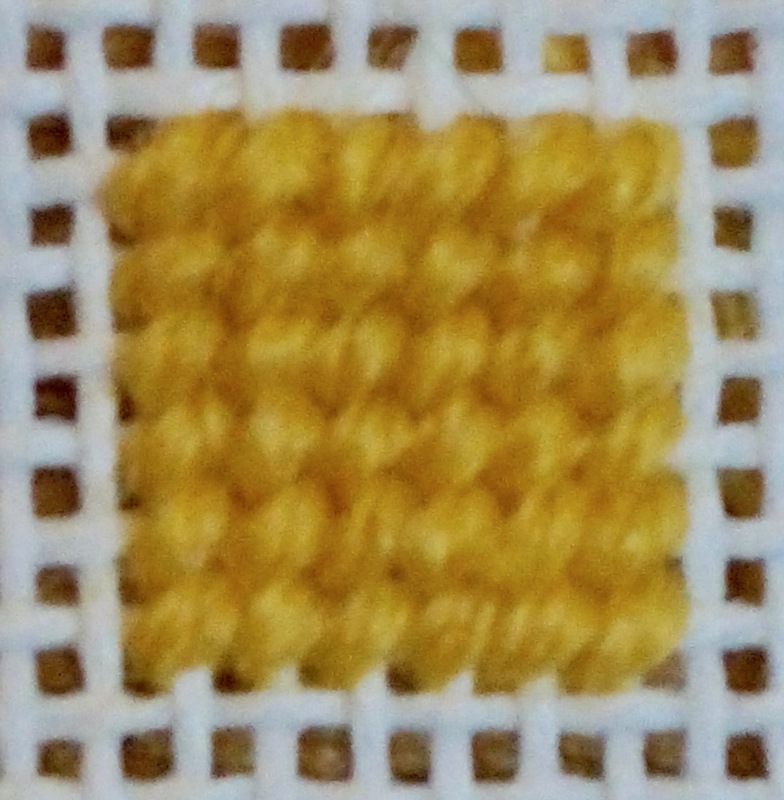 It lacks the durability of the Basketweave Stitch but can be worked in small areas, while providing a solid backing (as shown in Figure 3). My hat bands are usually done entirely in Continental Stitches. 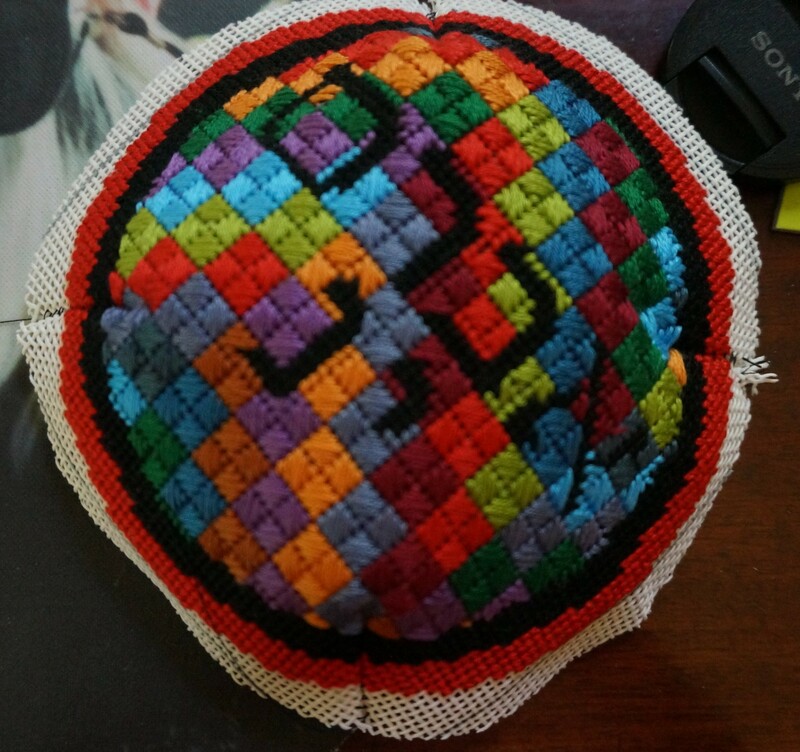 The No Tears Pillow was also done entirely in Continental Stitch. 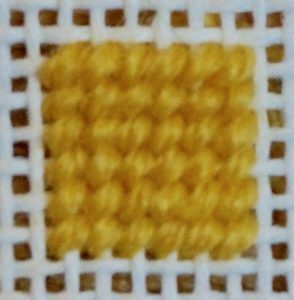 This is a good example of when you would not want to use the Basketweave Stitch for the background as it would have made the canvas much heavier than the fabric. 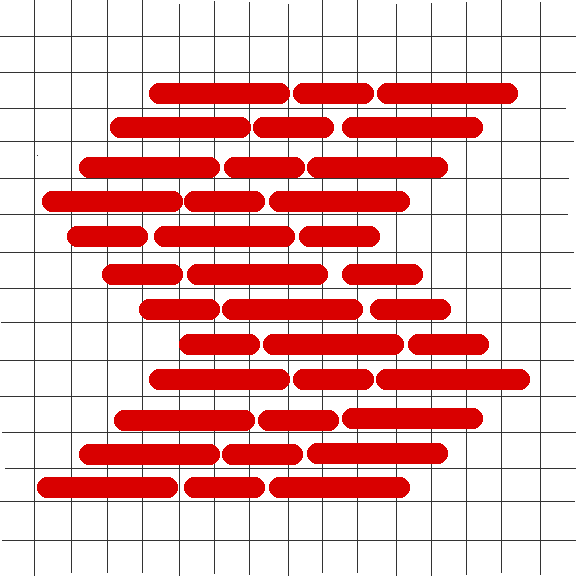 The Half-Cross Stitch provides no backing and is not recommended for backgrounds. It does not cover the canvas well and should only be used on printed canvases where the thread color matches the color of the print. 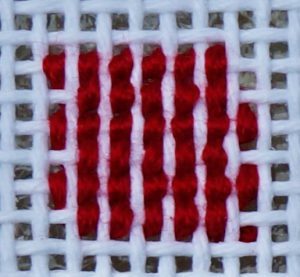 It does, however, use less thread than the Basketweave and Continental stitches. I have used it as the final row around a headband which is going to be turned under when I sew on the backing fabric. (6-strand DMC Cotton Floss and 3-strand Waverly Wool) and the canvases that NeedlePaint offers. Now having explained the how, when, where, and why of the Tent Stitch, I have to admit that I use it sparingly. 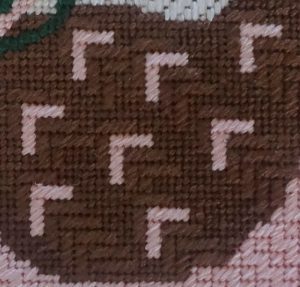 Coming soon My Favorite Background Stitches! With the warmer weather upon us, we definitely take notice of the living creatures that have been missing all winter; only to have made new homes and habitats in our backyards. Some of these creatures are sweet and friendly; the rabbit that likes to eat your flowers. Some annoying; the wasps that have made a new nest in your wind chime. And some . . . we’ve just never seen in our backyard before. This month at NeedlePaint, we’ve taken inspiration from nature, and have created two new needlepoint belts canvases. Our first new creation is the Southwestern Gecko needlepoint belt canvas; inspired by a sighting in my own backyard, and from some ancient cliff dwelling drawings. We’ve added a modern southwestern color twist to this gecko who runs along the length of our needlepoint belt. These gecko’s are clever, and secretive, and famous for climbing sheer vertical surfaces, walking up a wall, or hanging from the ceiling. What’s not to love about this lizard. 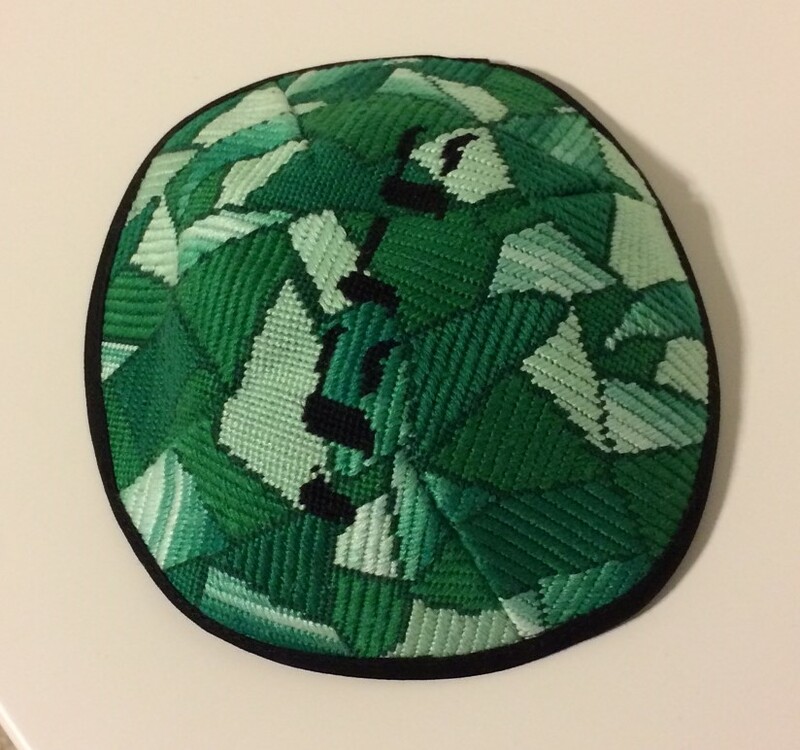 Another NeedlePaint nature inspired creation, is our Green Frog needlepoint belt canvas. Jumping across the length of this belt, who doesn’t have a vivid childhood memory of trying to catch that one elusive frog at the nearby pond or ditch. Too bad Mom, wouldn’t let you keep him! These belts are both colorful, both playful, both great for young and old. 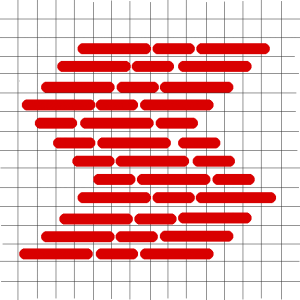 Available as a belt canvas you can stitch yourself, or a completely finished belt. 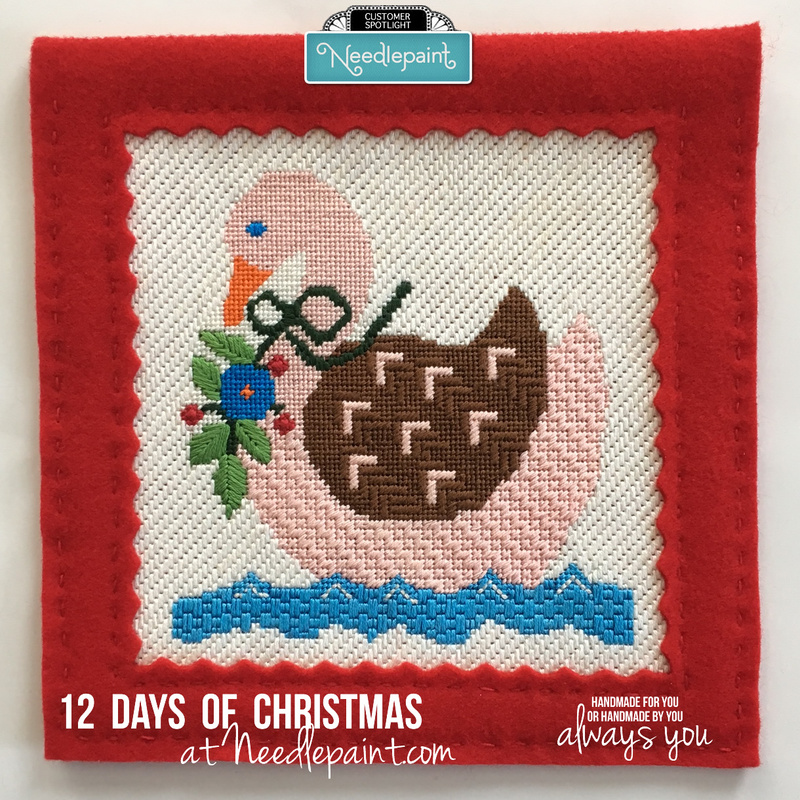 This is the perfect sized needlepoint project to take on a vacation; it’s smaller, more manageable, and will fit into your carry-on, or in your car’s glove box. We hope that you enjoy your summer, and embrace what nature has to offer. Even if it’s not cute and fuzzy! A “never seen before” visitor to my back yard . . . design inspiration! I’ve driven by the same local shopping center for over twenty years. When they first moved in, I thought their nautical theme a bit strange as we are located in “landlocked” Denver. Not a location where serious boating happens, but a place where family time is spent skiing down the slopes of the Rocky Mountains. This shopping center’s sign proudly displayed their name “Marina Pointe” flanked with colorful graphic squares, of which I assumed had something to do with boating. I didn’t think much more about this sign, until I noticed all of the nautical belts that customers order here at NeedlePaint. As the placement of these flags varied, I soon realized they were spelling out a message, not just randomly placed; and then the idea for a personalized nautical flag needlepoint pillow began. 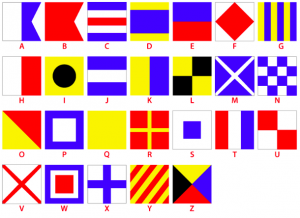 After further exploration (and some help from Seth’s sailing expertise), I discovered these colorful nautical signal flags began before short wave radio, as an easy and safe way to relay messages to other boats and people on shore. Each of these flags represents a letter of the alphabet or a phrase. Sketching some new ideas for a nautical pillow. In today’s busy world, it’s important to connect with family members, whether it be spending quality “unplugged” time together at home or through outdoor activities like boating or sailing. When your not sailing, creating a comforting tranquil home environment, and surrounding yourself with the things that are meaningful is key. 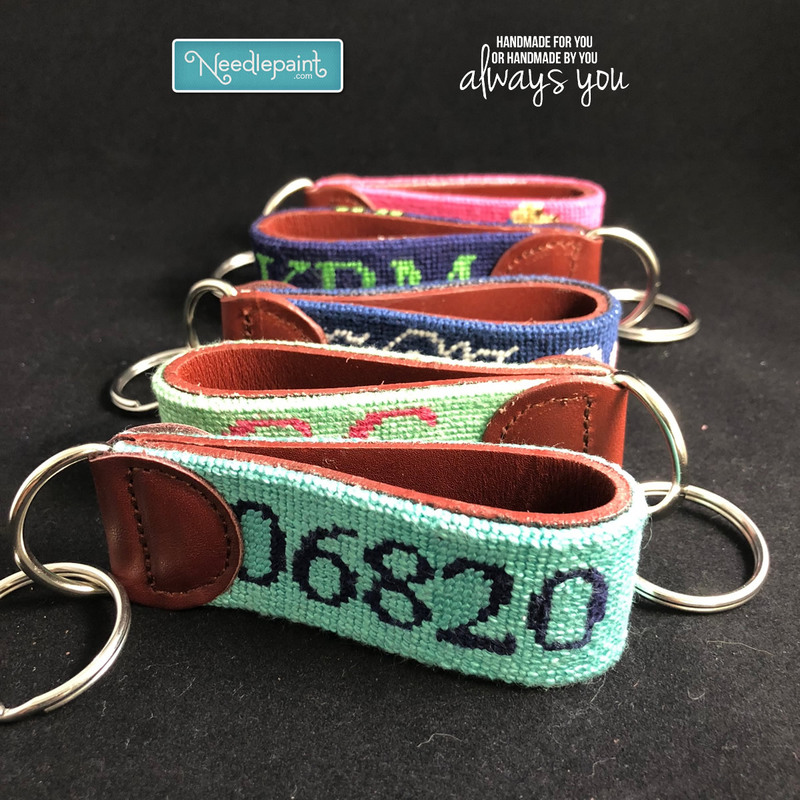 Incorporating personal items your grandmother made, your kids created in school, or that you have hand stitched; help save the memories your family has created together. This is truly what makes a living space “a home”. 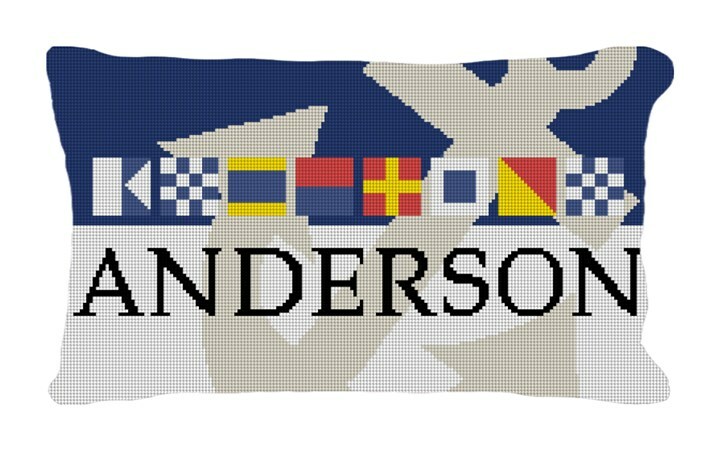 Our new needlepoint design for a personalized nautical pillow. 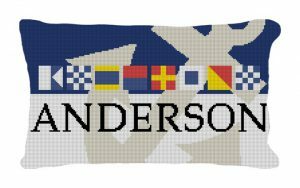 We’ve created this nautical pillow to remind you of the times your family has spent on the water together. 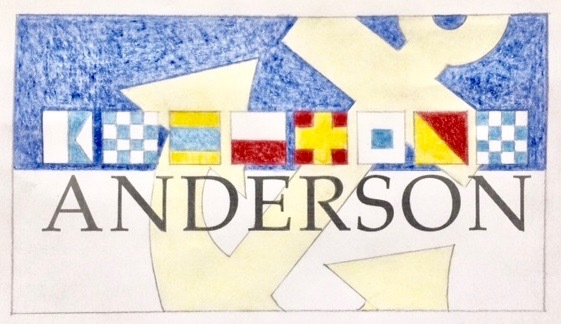 Personalized with your last name and the coordinating nautical flags that represent each letter. Available as a needlepoint canvas for you to stitch, or if you prefer we will do the stitching and create your pillow. Happy Sailing! 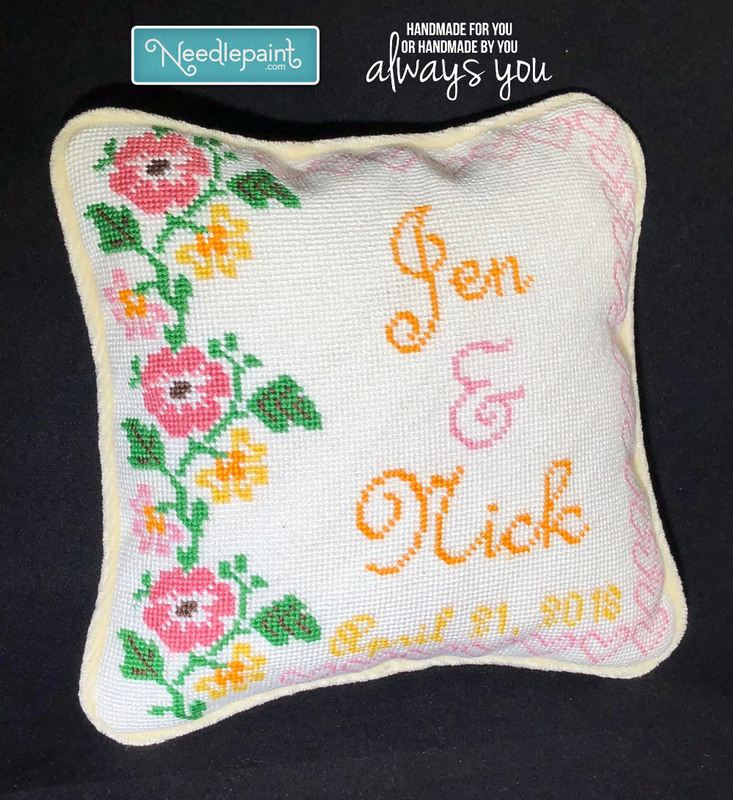 If you’ve purchased needlepoint kits from NeedlePaint in the past, you may know that we offer many types of finishing services. We have some very talented employees here, and I’d love to take a minute to show you what we can do! 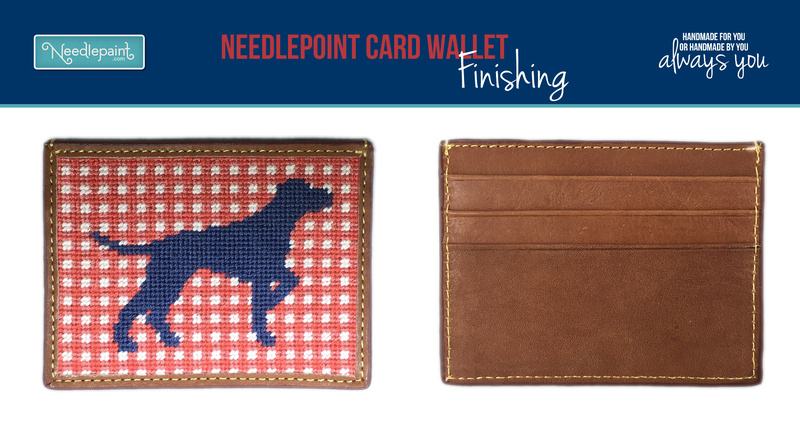 Once you are done with your needlepoint, we’d love to help. We offer a solid back with a hidden zipper (or no zipper on 8 inches or smaller), and can do piping or no piping. 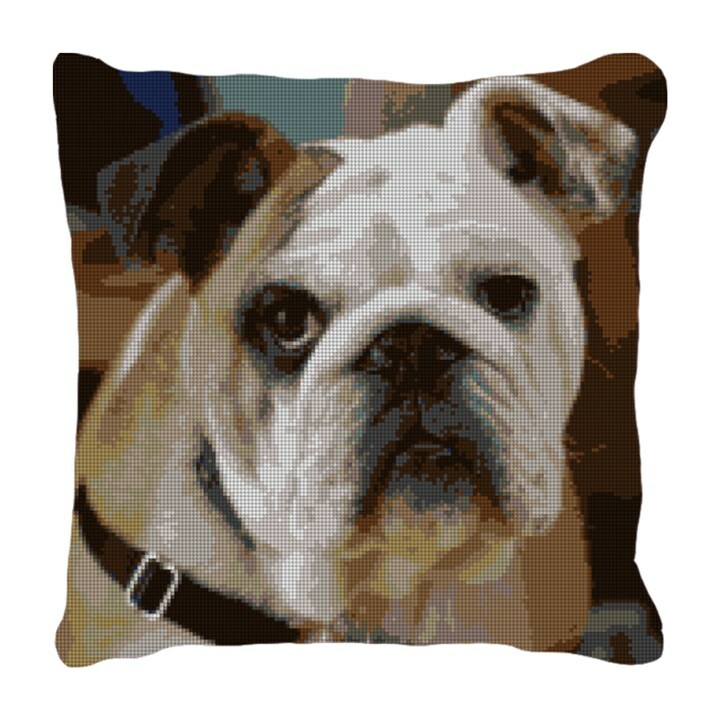 We include a removable pillow form on pillows that have a zipper. For the backing and piping, we have 20 colors of velvet to choose from. 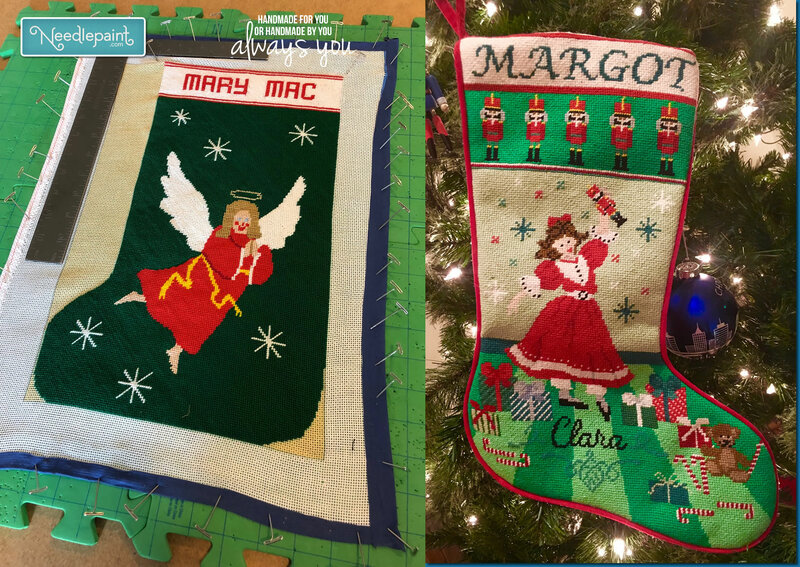 We finish stockings with a velvet back, piping, and hanging loop. Inside we put a white liner or coordination cotton liner. We will include a hidden zipper on the back, piping is optional on the front, and the inside is lined with a white liner to protect the tallis. Leather backed “loop” with leather tabs at the end, and circular key ring included. Card wallets made with full grain leather, and include three card slots, and an opening in the top to fold and store money and/or more cards. People love to wear their needlepoint! 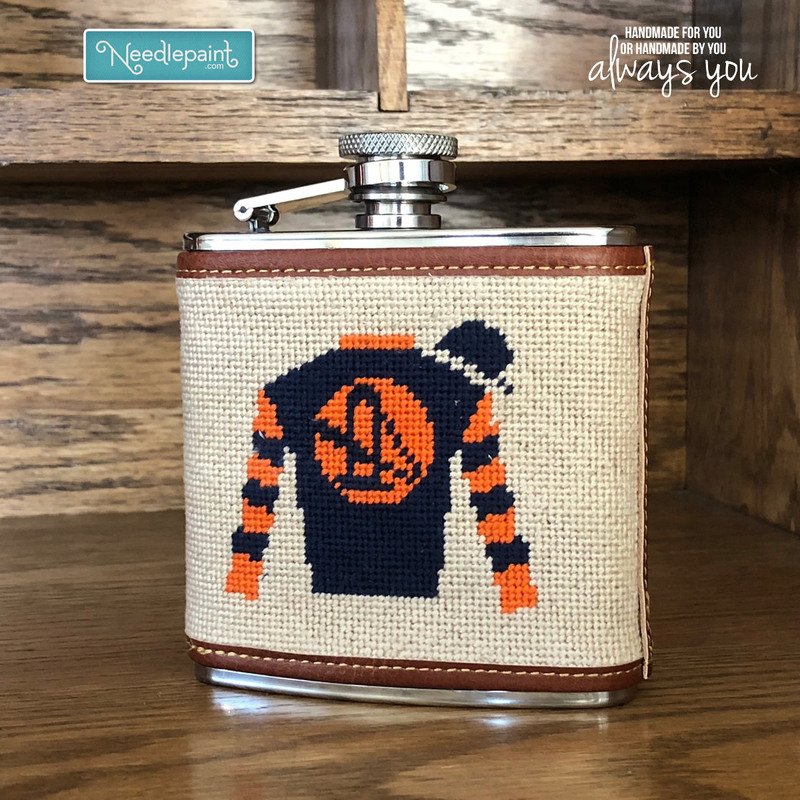 It is the biggest trend I’ve seen over the last 7 years, more and more needlepoint is being turned into products that can be used, especially amongst the younger generations. The most eye popping project we’ve worked on recently are needlepoint slippers and needlepoint loafers. Check these out! 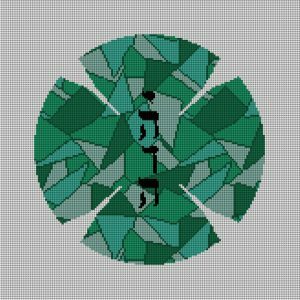 As far as needlepointing a project like this goes, it is pretty simple. 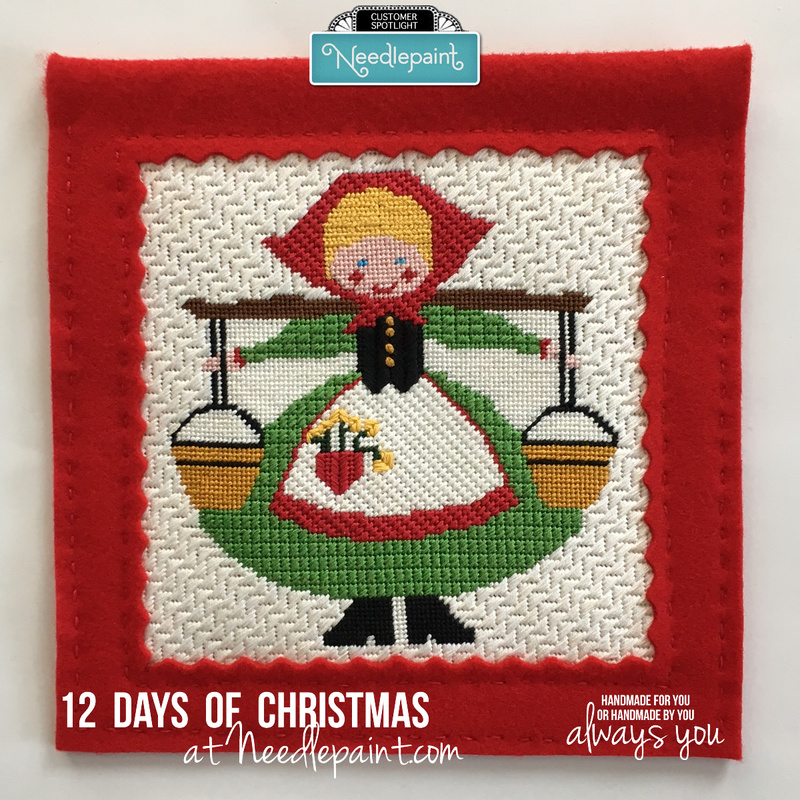 There are two needlepoint kits that come with thread, which you needlepoint the design area like most projects (in a tent stitch). Once you are done with the needlepoint, you send them off to be turned into slippers or loafers. Our customer recommended using: George Cleverly in London. Another finisher in the UK is Bowhill and Elliot. 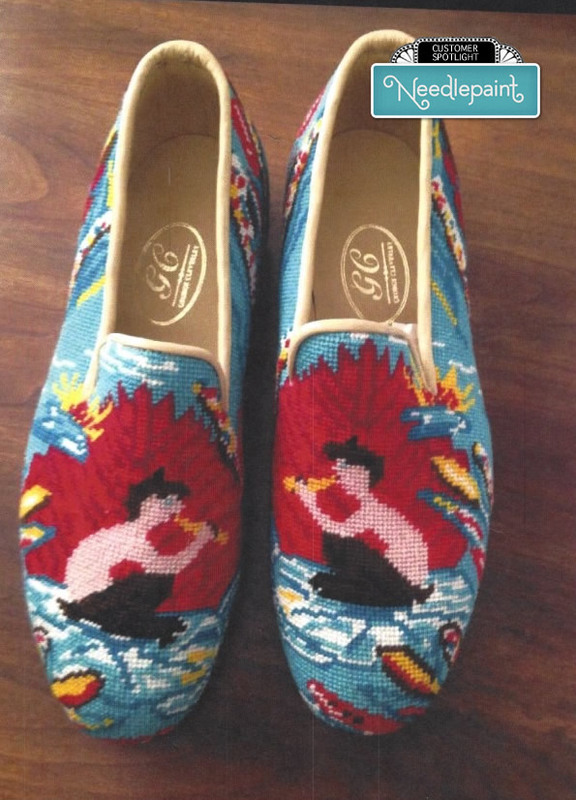 Below you can see a needlepointed canvas before and fully finished needlepoint loafers after, enjoy! The swan is the last of the birds. The only fancy feathering here is on the wings. 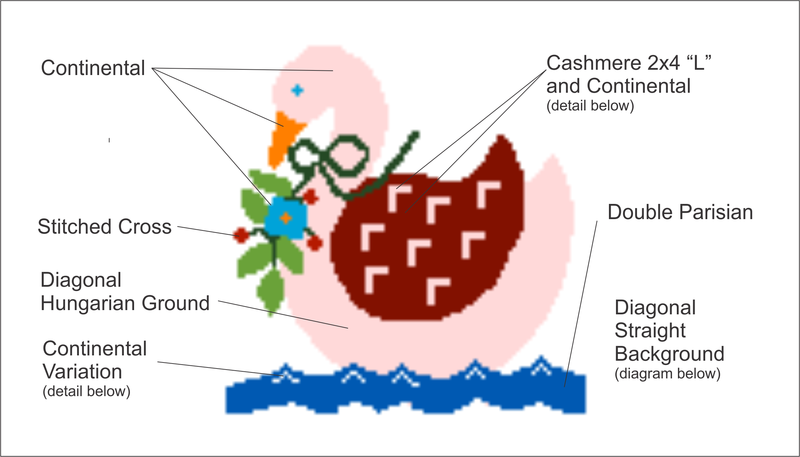 The pink “L”s in the wing are done with two Cashmere 2×4 stitches – one worked horizontally and the other vertically. 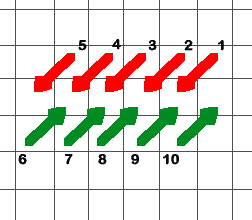 The “L”s are surrounded by brown “L”s where space permits and then the remainder of the wing is done in Continental as shown below. 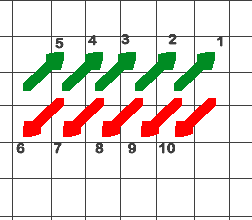 The main portion of the wave is the Double Parisian with the peaks done with left and right slanting Continental. And, the background Slanted Straight stitch is done over three canvas threads working right to left. 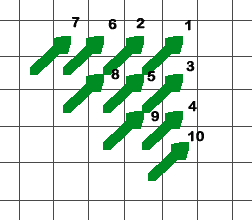 It is quick and easy. Our Maid is done with her work and is carrying her milk home from a job well done. 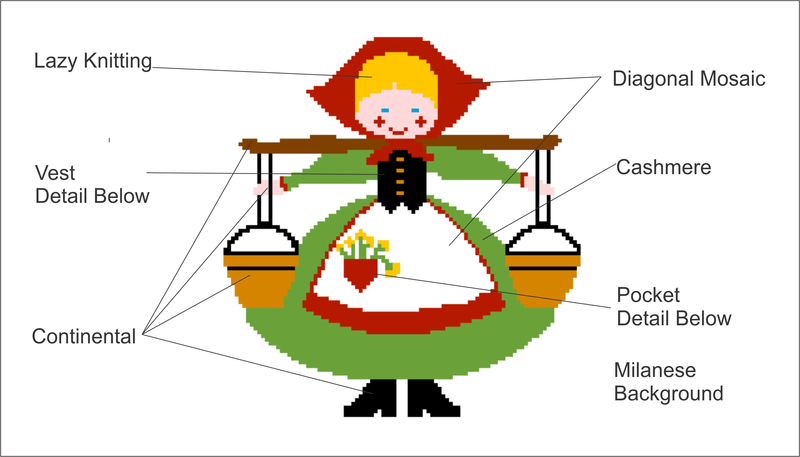 Her vest and pocket of flowers require some explanation. 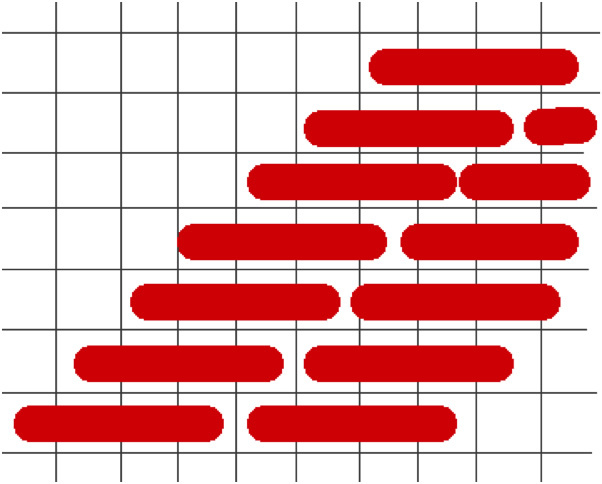 The center of the vest of worked in Slanted Gobelin 3×3 working left to right and right to left to form the lower points of the vest. 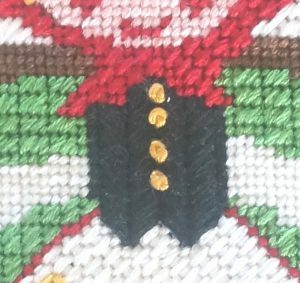 The edges are Continental and button French knots. The pocket is done in a manner similar to the heart of the Day 2 and the flowers are a satin stitch. 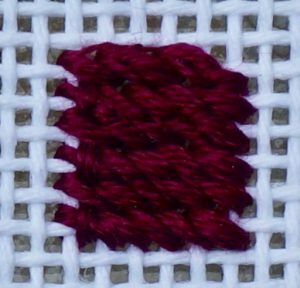 The Milanese stitch, like the Medieval Mosaic stitch, is quick and easy to do after getting it established. We’re back! I’ve been short on time because our lead designer is away on Maternity Leave. Also note, our other designer is going away for 3 weeks in August to help her mom move, so we’re taking a break on custom work from Aug.1 – 22. We can still do simple custom projects and Karen is here to do production on photo designs and stock designs, so feel free to email and check if you are in a rush. And onto Peggy’s next two stitch guides!!! 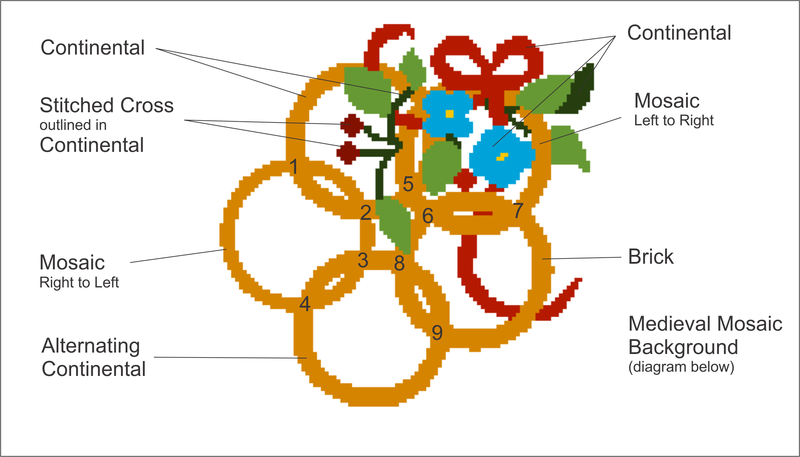 The Five Golden Rings needlepoint kit is a diversion from all the feathers, and also a challenge to get the correct placement of stitches for the interlocking of the rings. 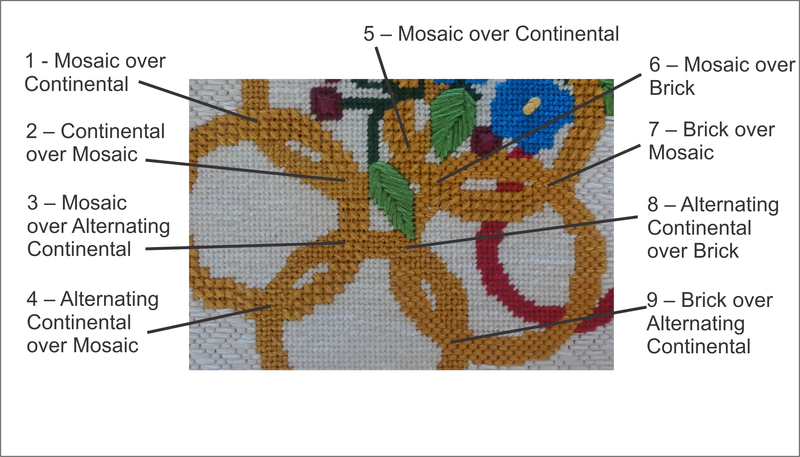 The center of each ring is done in Continental and each ring is done in a different stitch as noted on the diagram. 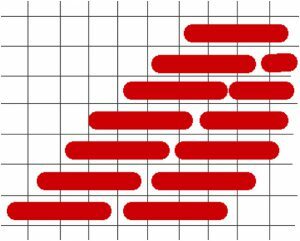 The Medieval Mosaic background stitch is a pattern found in mosaic ancient floors. 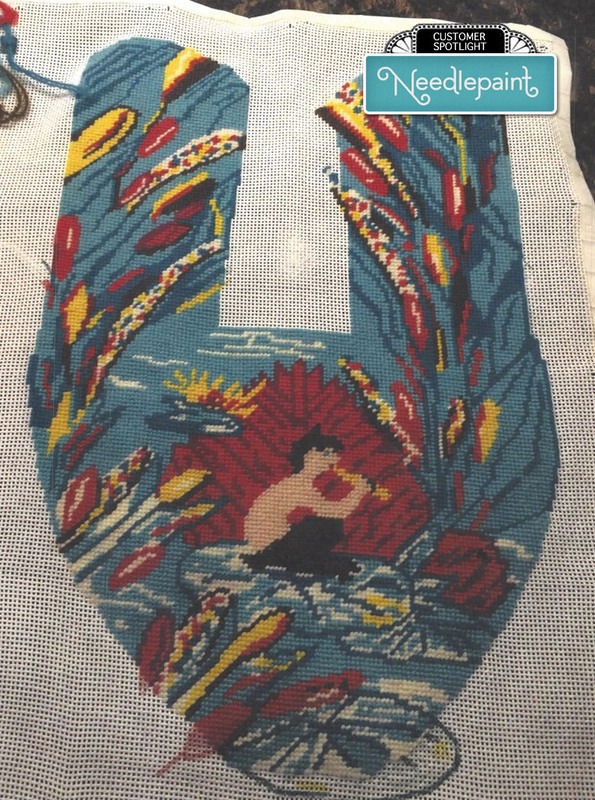 Once the first rows are done, working top to bottom, and the patterns established, the stitch is easy and it covers canvas quickly. It’s back to the birds with one of the Laying Geese. 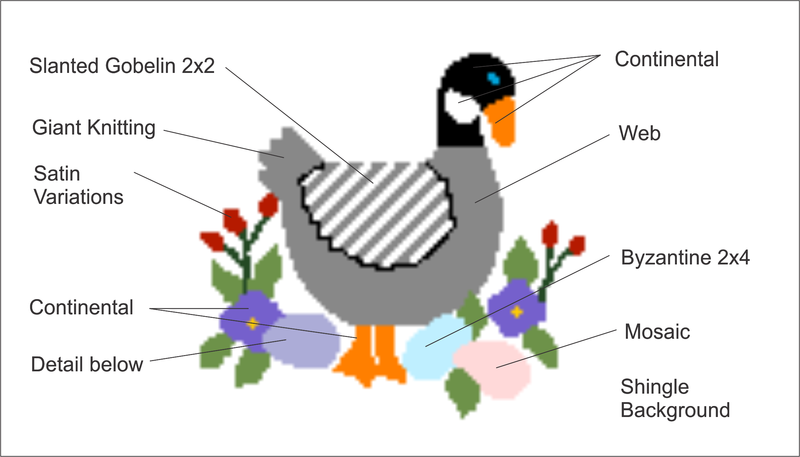 I doubt that the geese of the original song were Canadian geese, but I couldn’t resist making make one for Day 6. 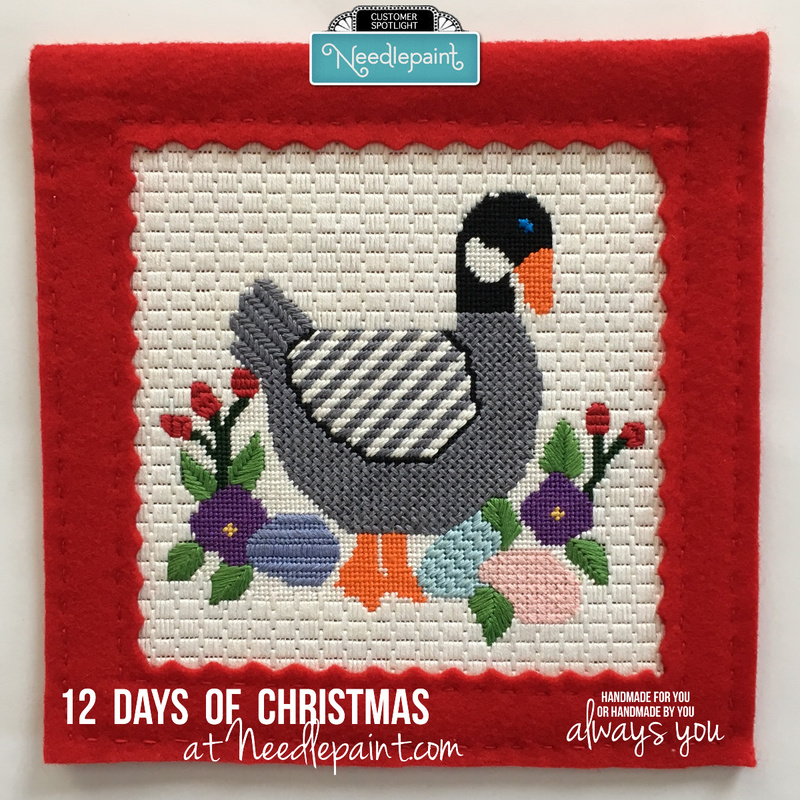 The Six laying geese needlepoint kit is on our website here. Nor could I resist giving my goose colored eggs. The blue and pink eggs are done in standard stitches as shown above, but the lavender egg has horizontally symmetric stitching as shown in the detail below. The center is a vertical straight stitch over 3 canvas threads and the top and bottom are Continental and Slanted Gobelin 2×2, done left to right for the top and right to left for the bottom. 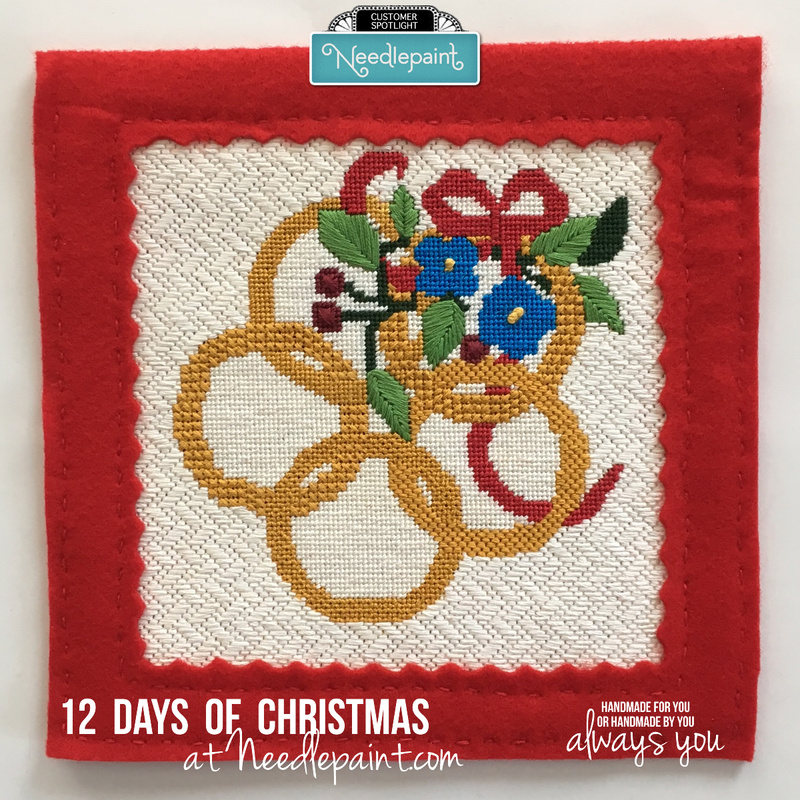 The Shingle stitch for the background is my favorite of the background stitches used in this project and is the only one that I repeated. It will be seen again on Day 11. This is the half way mark… only one more feathered friend to go!